(Ottawa, Ont.) Wheelchair Basketball Canada is thrilled to once again team up with NBA Canada for a fourth consecutive cross-country basketball celebration tour. 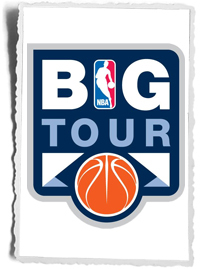 The 2013 NBA Big Tour will take place in five cities across Canada from September 7 to October 19, 2013. Wheelchair Basketball Canada, in partnership with its provincial sport organization members, will organize a wheelchair basketball demonstration at all of the tour stops. Spectators will also have the opportunity to join in and try the sport themselves. “We are proud to partner with NBA Canada for a fourth consecutive year. The Big Tour festivities are a great way for everyone to celebrate the sport of basketball and we look forward to showcasing our tremendous sport and our talented athletes at all five stops across Canada,” said Wendy Gittens, Wheelchair Basketball Canada Executive Director. Elite wheelchair basketball players will be on hand to take pictures and sign autographs at all of the sessions. For more information about the NBA Big Tour, visit the NBA Canada [Facebook] page.